At one point in Brian O’Malley’s debut feature, acerbic police sergeant Jim MacReady (Russell) states, “The world is full of evil. Police stations doubly so.” It’s a perfect summing up of the situation the movie is concerned with, as the small Scottish town of Inveree – population: seven, plus hundreds of crows – finds itself the focus of a night of retribution instigated by a mysterious bearded figure referred to only as Six (Cunningham) (for the cell he’s assigned to). Each person who finds themself in the town’s police station has their secrets, some more obvious than others, but you can bet that by the time the midnight hour arrives that there won’t be any secrets anymore – or perhaps anyone alive. There’s the aforementioned Sgt MacReady, the officer in charge, a forty-something relic from a previous generation of policing whose caustic approach to people and police procedure hides a very dark personal secret indeed. Then there’s newbie Rachel McHeggie (McIntosh), a police constable working her very first shift at the station who is still dealing with the trauma of events from her childhood. Completing the police roster are PC Jack Warnock (Larkin) and PC Jennifer Mundie (Stanbridge), who share more than the one secret, their relationship one of mutual affinity and dependency. In the cells already is a teacher with a penchant for beating his wife, Ralph Beswick (Watson), and joining him after being arrested earlier by Heggie, is local hooligan Caesar (Vernel). Caesar’s arrest is for apparently hitting Six while driving at speed through the town, but while there’s blood on the headlights, there’s no sign of Six’s body. Later, Warnock and Mundie find Six and bring him to the station, where a head wound he has prompts them to call in a local doctor, Hume (Fulton). And yes, Hume has a terrible secret, just like everyone else. 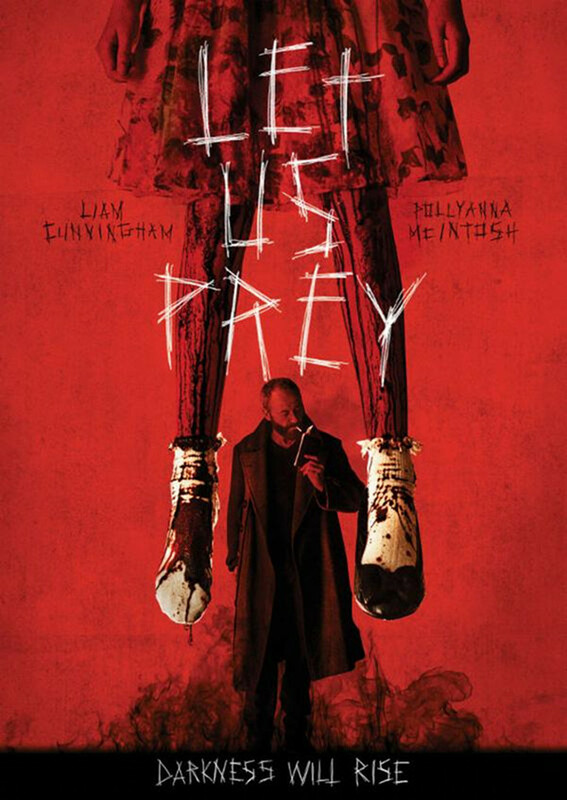 With everyone in place and Six about to stir things up, Let Us Prey is poised to offer up a smorgasbord of tension, ultra-violence, psychological terror, and heightened realism. What it provides instead is a juiced-up series of extreme physical shocks interspersed with cod-religious truisms, rampant melodrama, and any number of plot developments that feel forced and/or contrived. Along the way, eagle-eyed (and -eared) viewers will spot John Carpenter’s heavy influence, from the movie’s Assault on Precinct 13 (1976)-style setting, to the electronic-based score by Steve Lynch with its thudding sub-Carpenter phrasing. Not a bad pedigree, by any means, but though imitation may well be the sincerest form of flattery, here it’s used to bludgeon the audience with a succession of moments where violence is meted out in either cartoonish or visceral fashion, and with no clear tone established from one moment to the next. 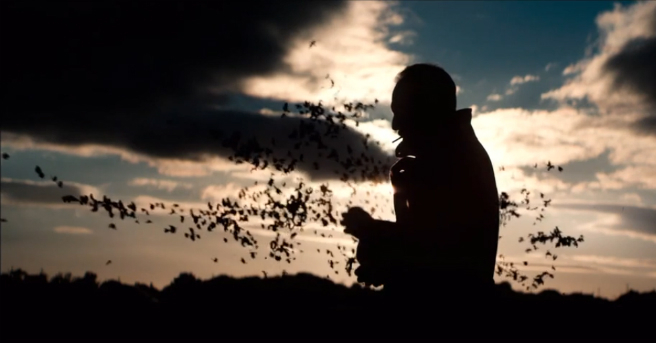 The movie does open well though, with atmospheric shots of Six emerging from the rocks of a broiling seashore, with spray and fume crashing together in great arcs, and crows littering the sky above. As Six makes his way inland, crossing hills and fields until he arrives at Inveree, the script – by Fiona Watson and David Cairns with additional input from O’Malley – looks as if it’s going to retain the atmosphere it’s already built up, and those opening, highly distinctive and impressive shots will serve as a template for the rest of the movie. Alas, this idea proves short-lived, and the law of budgetary constraints begins to make itself felt, with the police station divided into two main sets: the office space (there’s no front desk or area separating the public from the police), and the cells at the rear. Aiming for an increasingly claustrophobic vibe from the start, the movie settles instead for using these areas as drab backdrops to the main action, bursts of unsettling violence that don’t always fit organically into the overall narrative, and which serve, strangely enough, to take the viewer out of the flow of the story. The idea of a stranger who knows everyone’s deepest, darkest secrets and who exploits those secrets for his or her own ends isn’t exactly a new concept (J.B. Priestley’s An Inspector Calls (1954) is probably the best version yet made), and here the use of Six as an instigator for what appears to be divine retribution, albeit through a less than heavenly approach, is given better credence than expected thanks to Cunningham’s resolute performance, and scathing impatience with the denials of others. Cunningham is a character actor whose career hasn’t always allowed him to deliver the kind of performances that would have made him better known, but this is one where he fleshes out the mystery of his character with a seething, pitiless bearing that makes even more sense when his identity is revealed near the end. As the heroine of the movie, McIntosh is another in a long line of cinematic female warriors, taking her lumps but coming through against much greater odds. Her character’s back story (and related “secret”) is used to differentiate her from the other participants, and though the importance of it all is fumbled in terms of how it relates to her involvement now, it does help provide the movie with an ending that is both unexpected and somewhat baffling. 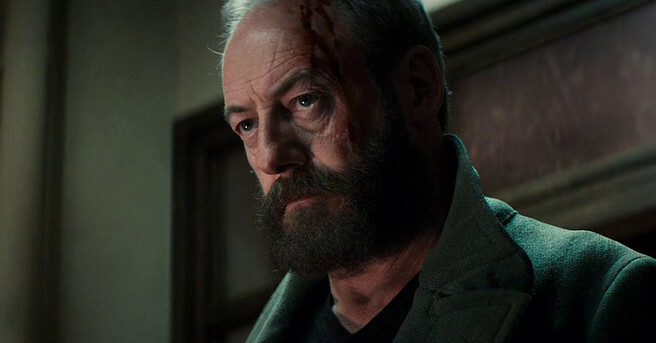 Though O’Malley directs with a great deal of verve, and an appreciation of the genre he’s working in, the movie is still let down by the vagaries of its script and the various directions it takes along the way, as well as some crushingly awful dialogue (sometimes it’s better if characters don’t explain their reasons for murdering/torturing people; the justifications screenwriters come up with always seem to defeat the best of actors). There’s some uneasy humour added here and there to the mix, but on the whole, the movie opts for a fierce, angry tone that it tries hard to escalate the longer events go on. This unfortunately leads to scenes where melodrama swiftly turns to unrepentant psychodrama, and the motives of the characters become less and less persuasive, and more in keeping with the way in which the script needs to tie things up. A good try, then, but like so many low budget horror thrillers, not quite managing to achieve the goals it’s given itself. Rating: 5/10 – while there’s a fair amount to admire here, in the end Let Us Prey can’t maintain a consistent tone, or make the viewer care about any of the characters, plus it places too much emphasis on providing moments of extreme violence in place of ratcheting up the tension; solid enough to keep viewers watching until the end, and grisly enough to keep gorehounds happy, the movie wastes too many opportunities to provide a more satisfying experience.